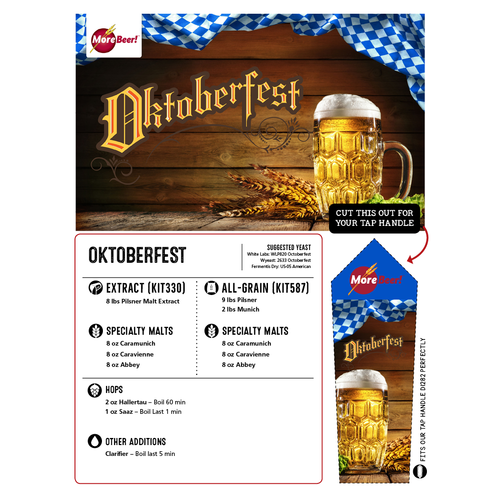 This Oktoberfest beer recipe makes, in our slightly biased opinion, one of the best Oktoberfest beers out there! 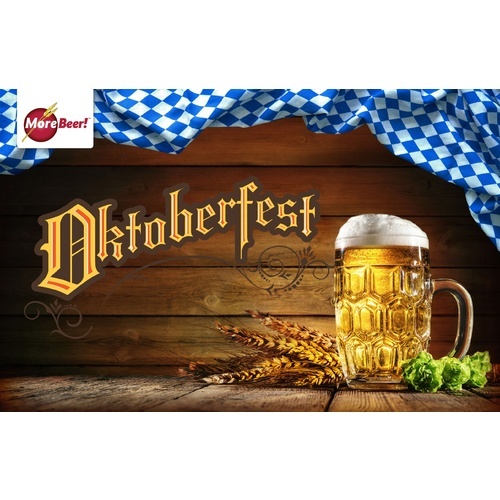 With a strong emphasis on the German malt flavor, it's sure to please anyone looking for a classic Oktoberfest beer. It is a copper-colored Lager that achieves that malt flavor with lots of Pilsner malt extract. The use of Caravienne and Caramunich malts contribute the copper color and a unique, subdued toffee/malt flavor. First-addition hops are Hallertauer, while finishing-hops are Czech Saaz. Great beer for our Oktoberfest event. It is October and my friends like malty unhopped lagers. Go figure. How many Yeast packets do you recommend for this recipe? Is one enough? BEST ANSWER: I used two packets of Fermintis S-23 Lager yeast and was happy with the results. It may have fermented adequately with 1 packet, but I have found using 2 packets is best with Extract because it helps minimize the potential for Extract beers to end up too sweet. That depends. If you make a starter and grow it up for a couple days then one packet is enough. But, if you’re direct pitching, and because lagers ferment at a cooler temp and you want fermentation to start fast, I’d go with two packets. One is fine if you are buying the prepackaged and if your are making your own yeast form dry pack I use 2 table spoonsand fallow the directions for the yeast. Hope this is helpful. One is enough for an Oktoberfest, just get some good aeration in the mix first. If you’re doing liquid yeast consider a starter. when I made this kit I made a starter. However, I think one packet of yeast will work ok. I used two packs. hydrated each. The brew is still in the carboy, I didn’t receive corn sugar in recipe pack! I want to transfer to a take that will have co 2 to dispense! Do I need the corn sugar to carbonate? This was my first attempt at a lager and it tasted pretty good. The beer was pretty true to style. My only problem was that my beer was much darker than a typical Oktoberfest but it is an extract kit so I didn’t think much of it. This is a time consuming and knowledge based product, I did a lot of studying about how to do a lager and thought I could. Tasted ok, waited longer it tasted ok, put a couple in the fridge and waited longer tasted better but still ok.
My first lager, best beer I have made yet! I didn't know what to think about this beer at first. So glad I made it! smooth, flavorful, crisp, not hoppy. I brewed this as an all grain, and paired it with wlp820 yeast. Kegged 5 gallons and it wasn't enough.... My friends and family made it disappear withing days! even a few people that don't drink our "real beer" loved it! I'm making a 10 gallon batch for my second run. I'm gonna have to wrap the kezer with an electric fence!!!! Brewed this beer for an Oktobefest party last year. Same as another reviewer... I brewed it the first week of August and let it lager until I kegged it the week before the party. Everyone really liked this one. It was the first keg kicked. It's definitely nothing crazy, just a solid representation of the style. Will be making this again next year. Always brew this for our annual Octoberfest party, start the first week of August and let it lager until kegging. Just fantastic. 15 moochers and never a complaint.